ColourpopCosmetics is a Cruelty-Free🐇Beauty Company with many 🌱Vegan-Friendly Products here’s the List! Provided through Email by Colour pop PR. Thanks for reaching out regarding your concerns. We are happy to answer any questions you have to get this cleared up and appreciate you seeking correct information to share with your followers! We are sure they appreciate it as well! We have not reformulated our products and our ingredients list are up to date. This ingredient list is called a composite ingredient listing. Government regulations state that you can have individual listings per shade or a composite ingredient listing that covers all shades. You will notice that there is a bracket with a +/- at about the middle of our ingredient listing. This symbol means “may contain”. All items listed after the [+/-] are “may contain” ingredients. In other words these are ingredients that are used in some of our shades but not all of them. As we have a huge shade range and are continually launching new shades, this is the most efficient and accurate way to list the ingredients that are contained in our products. Most major brands (including MAC) list their ingredients in this “composite ingredient listing” format. This is because it would be very time consuming and tedious for brands with multiple shades and frequent launches to update the exact ingredients for every single shade. Thus according to government regulations our products are represented accurately and at industry standard. Due to the composite ingredient listing format, we have chosen to list the shades that use “Carmine” on our site as many of our lovely customers are vegan and this information is very important to them. This list is accurate and the remaining of our products are vegan as our FAQ page states. We do not currently have plans of making a Vegan Friendly Tab but this is a great idea and I will pass it on to the team! ➡️🚫Super Shocks Shadows That Are Not Vegan! ➡️🚫Super Shock Cheeks That are NOT VEGAN! ➡️🚫 Super Shock Cheeks Pearlized That Are NOT VEGAN! ➡️🚫 Ultra Matte Lip💄That Are NOT VEGAN! ➡️🚫Gel Colour & Liner That are NOT VEGAN! ➡️🚫Ultra Metallic Lip💄That are NOT VEGAN! 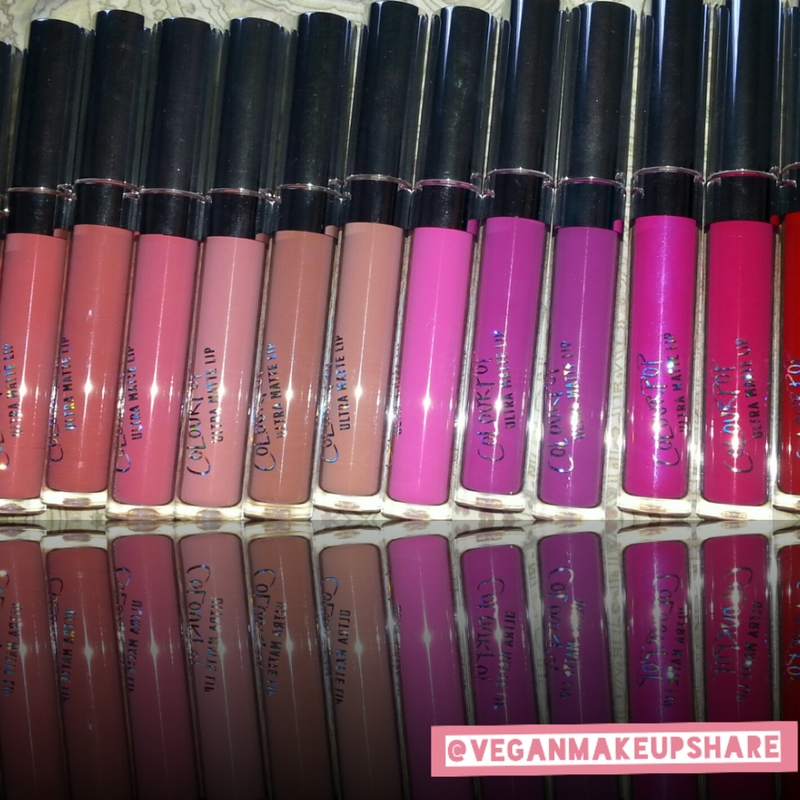 ➡️🚫Ultra Glossy Lip💄That are NOT VEGAN! And wait 2mins then start applying your favorite Colour Pop Cosmetics Ultra Matte Liquid Lipstick👄!!! I’ve also heard that The Ultra matte Collection is very difficult to take off!!! Honestly it is! Which is a Pro& a Con!